The fifth volume in our Mythic Monsters series, Mythic Monsters: Mythos brings you a dozen and one alien horrors from beyond the stars! Twelve of your favorite eldritch abominations are here, updated for the mythic rules, and when we say updated we mean complete stat blocks, yes, but more than that every unearthly and indescribable Thing from Beyond has its own unique and exciting new mythic abilities, from an mythic shantak’s disemboweling flyby to the temporal retribution of a mythic hound of Tindalos! This product includes mythic oozes of familiar alien horrors like the gibbering mouther and shoggoth as well as more obscure alien creatures like the faceless stalker and moon-beast, covering CRs from 4 to 24. 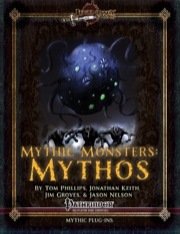 In addition to a dozen existing otherworldly foes, Mythic Monsters: Mythos also enumerates every creature from the official Pathfinder Roleplaying Game Bestiaries (and a few more besides) that qualifies for the mythos descriptor, as well as mythic path abilities for alien alchemy and the mysterious Elder Signs, plus four mythic alchemical compounds to spice up the laboratory of your favorite deranged researcher of the cosmos. To top it all off, Mythic Monsters: Mythos introduces an entirely new 13th mythic monster, the swift and deadly mythic greater byakhee, a star-spanning mount, minion, and menace perfect for the summoning rituals of your local cosmic cultists! Ships from our warehouse in 8 to 26 business days. This supplement clocks in at 34 pages, including seven pages of covers and legal matter, leaving us with 27 pages of content. Each installment in Legendary Games’ Mythic Monster series contains 13-14 mythic monsters: one original and the others mythic versions of nonmythic creatures from previous Paizo and Legendary Games supplements. The mythic-ized old monsters’ entries consist almost entirely of crunch, with minimal fluff to describe their new abilities and no artwork. The new monster in each supplement comes with complete fluff and crunch, along with a full page, full color illustration. Additionally, each installment begins with a few mythic feats, path abilities, or new miscellaneous game mechanics related to the type of creature featured in the supplement. This installment begins by introducing a Mythos spell-descriptor and a Mythos monster subtype. These have no effect aside from interactions with specific abilities. 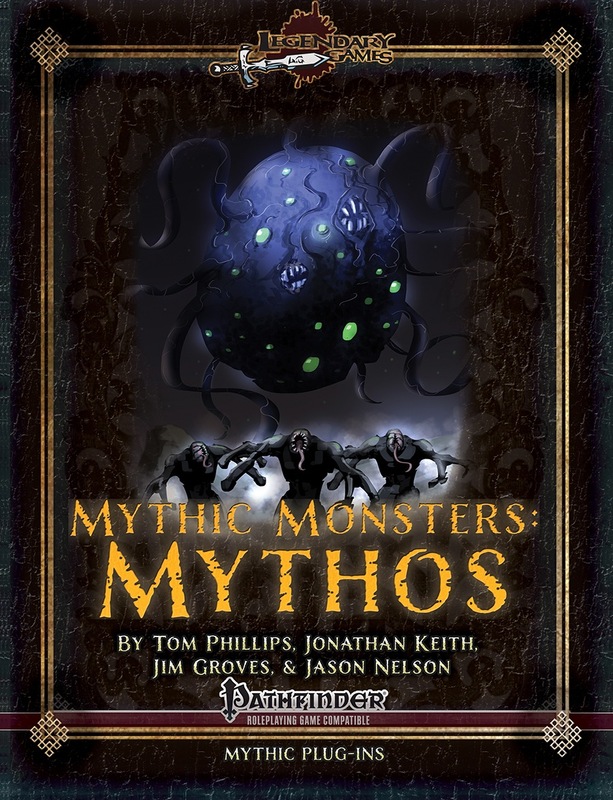 All monsters in this supplement have the mythos subtype, and it lists several other pathfinder monsters which are retroactively assigned the mythos subtype. It does not, however, specify which spells have the mythos descriptor, leaving us to guess. The mythos descriptor and subtype are presented in “greater detail” in other horror-themed Legendary Games products, including the Gothic Campaign Compendium. Without those, though, you will have difficulty using abilities that reference the mythos spell descriptor. Subsequently, we get two new mythic path abilities: Alien Alchemy, which gives alchemical creations greater effect against mythos subtype monsters, and Elder Signs, which grants four unique abilities for making specific hand signs (as a move action). Elder Signs is available for both archmages and hierophants, while Alien Alchemy is available to both archmages and tricksters. Next we get four horror-themed alchemical compounds, with effects related to mythos subtype monsters and spells with the mythos descriptor (the lack of knowing which spells it applies to continues to bother users without previous Legendary Games supplements). After that we get the main portion of the book: 12 mythic monsters which are upgraded versions of previously released monsters, with hyperlinks to the original monsters on d20pfsrd.com. At the low end, we have the CR 4/MR 1 Mythic Cerebric Fungus. It can confuse anyone who strikes or is struck by it in melee, and blur its enemies’ visions giving them a miss chance. At the high end, we have the CR 24/MR 9 Mythic Shoggoth. In addition to upgraded versions of a normal Shoggoth’s abilities, this beast paralysis creatures who strike it in melee. It is a “gravity agnostic”, a flavorful ability allowing it to climb in any direction. It has a superior form of regeneration identical to that of the 3.5 tarrasque. And it has a daily ability to create a permanent non-mythic Shoggoth as a spawn! Unlike in other Mythic Monsters supplements, the ‘new’ mythic monster is not actually new; it is a mythic version of a monster from d20 Call of Cthulhu. Even if you don’t have CoC, the CR 8/MR 3 Mythic Greater Bhyakee comes with a full description of its abilities, lore, and a full page color illustration. The fluff is rather bland: it’s yet another Evil totally alien unspeakable Evil creature with indescribable Evil motives that does Evil things that can’t be envisioned, and did we mention evil it is Evil? If you are feeling déjà vu from that description, it is probably due to it being the same lore given to almost every aberration, undead, and evil-aligned outsider in the monster books. Nonetheless, its mechanical abilities are interesting and clearly described, making it a fun creature to fight for a relatively straightforward combat. Short Term Rating: After the initial hurdle of the [mythos] spell descriptor which applies to some specific spells that aren’t actually specified, we get 13 solid mythic stat-blocks with interesting abilities which can be put into a pathfinder campaign with relative ease, for a final short term rating of 4.5/5. Long Term Rating: The monster abilities given bring considerable use to a pathfinder GM, either on the monsters they come with or when you are looking for interesting powers to give your own monsters. The mythic subtype and trickster path ability are nice to have for a mythos-themed campaign, although neither are particularly radical in either concept or execution. The Elder Signs ability might be fun to play with even in a non-mythic campaign. Overall, the crunch-filled monster stat-blocks are where the real value is, for a long term rating of 4/5. Woo, thanks Liz! Ia! Ia! Fthagn! Sold! Been waiting for this. Oh happy day, well for me anyway, not so much for my players. First read through and colour (out of space) me impressed. Some really good stuff in here. I do have a few quick questions. 1) What action is required by the hound to activate its bilocation? 2) A shoggoths chilling paralysis applies whenever someone attacks it yet not when it attacks them(save for the engulf and trample)? Is this intentional? Thanks for the quick response. If I may ask; did you feel the chilling aura would be too powerful to apply to the shoggoths normal attacks? The save is certainly pretty scary and since it appears to get free AoO I imagine it could all too easily turn into a TPK machine. You are perceptive indeed. I mean, it's SUPPOSED to be kind of a TPK machine at CR 24, but I suppose in principle it's also supposed to represent the squishy, chilling ick INSIDE the creature when you stab it or bash it or when it swallows you. A blunt impact from its appendages isn't quite as chilling and grossifying as the gooey insidey parts. True. Although for grossifying I think the Gug wins out. I really would love to see a follow up to this one. The mythic abilities in here are really good and that list of mythos creatures at the start conatins some of my favourites. True. Although for grossifying I think the Gug wins out. Jason & Co.; you guys are awesome. Published just in time for my first episode of Wake of the Watcher this weekend. I've already tossed aside the two Hounds of Tindalos and put in a Mythic Hound of Tindalos instead (the PCs all have one mythic tier at the moment). Kudos to Legendary Games once more. Yeah, this was my reaction as well when I browsed through the PDF. I'll be starting up Wake of the Watcher soon and the hound of Tindalos provoked maniacal laughter. As for the subscription thing, I'd be on board in a heartbeat. Whelp, there goes the last of my gencon money. Hey quick question Jason, when using the madness mechanics how do you integrate them with things like the Allips madness ability? Do you leave it as is, modify it to madness damage, or do some mix? Other question, on the Unguent of Khefnis is the misleading vision supposed to be on a failed check of 5 or more or the written 50? Edit: Other question, are akata supposed to count as Mythos monsters alongside the moonflower? Edit Edit: Where is the description for Mucus of Terrible visions? Right now it's listed in the Cerebric Fungus' defensive abilities as a mythic ability but it isn't listed in there or mythic adventures. 3. Mucus of terrible visions got renamed to "intrusive visions" because we wanted to avoid any kind of confusion about "well, if it's mucus do I have to touch it, does it require bare skin contact, blah blah blah." Generally speaking, abilities like the allip's madness just do what they say they do--cause confusion, ability damage, etc. If you like, you could substitute Madness points for Wisdom damage and get a more interesting set of effects from "madness" abilities like that. Sweet! Will both of those be added here soon in an update? Also does the faceless stalker have a blood drain ability like the vanilla version or does it only have the blood drain ability brought on by its blood leaching ability? Other quick one is that supposed to be leeching or the written leaching? It has the blood drain UMR as well as its blood drain. And leaching is correct in this context. I am so pleased people like the Hounds! And if you just can't get enough of that mythic stuff... check out Mythic Monsters: Oozes Too, now available from the Legendary Games webstore and next week right here at Paizo.com as well as DrivethruRPG and shop.d20pfsrd! Other question, on the Unguent of Khefnis is the misleading vision supposed to be on a failed check of 5 or more or the written 50?. 50, it's a d% roll against craft (alchemy), not. A D20 roll. I think it gives the roll a bit of a feel like the old call of Cthulhu by chaosium. -I'm interested in making a non-mythic version, so which of its powers were granted from being mythic? Based on the MA superscript in its stat block, Toxic Cesspit, Unspeakable Molt, and Carry Off are definitely three of them. Rend is also apparently mythic, though I'm not sure how. Was this an error, and if so what's the final power? Is it alien amalgam? -Was the non-mythic greater byakhee CR 6 or 7? Thanks a bunch if the Legendary team can help me out with this. *Edit: I think the mythic byakhee's fourth mythic ability may be acid/cold resistance 20. My group gained their first mythic tier at the end of Trial of the Beast, and they are nearing the end of Broken Moon now. By the time they start Wake of the Watcher they should be mythic tier 3. Reviewed first on Endzeitgeist.com, then submitted to Nerdtrek and GMS magazine and posted here, on OBS and d20pfsrd.com's shop. Cheers! The hyperlinking issue is interesting and unfortunate. Many of those were my creatures and I did hyperlink them in one version. However we did a real thorough editing scrub on them to make sure the mechanics were sound and the abilities actually made sense when read objectively. I think at that point the hyperlinking got lost. I'll have to check with Jason, but I'm sure that's an issue we can fix. Yep, should be fixable. I'll add it to the docket for layout tasks.